Promoter: I Want To Match Andrade Against Elite at 160 - ASAP! 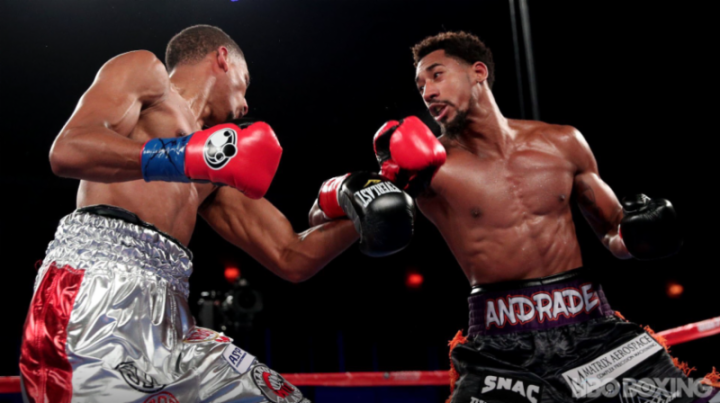 Last night at Turning Stone Resort and Casino, in Verona New York, undefeated two time Jr. Middleweight World Champion, Demetrius "Boo Boo" Andrade (Providence, RI, 25-0 16KO's), made a successful debut in the Middleweight division by dominating previously unbeaten Alantez "Slyaza" Fox (Forestville, MD, 23-1-1 11KO's) over 12 rounds of action. All three judges had Andrade ahead by scores of 118-110, 118-109, and 116-111. Andrade captured the vacant ABO Middleweight title. The bout was seen live on the popular HBO Boxing After Dark series. Andrade, promoted by Joe DeGuardia's Star Boxing and Banner Promotions, came out strong in the first round and had Fox in serious trouble after landing a beautiful straight left hand to the chin, but to Fox's credit, he was able to hang on and survive the round. Andrade used a balanced attack and maintained an aggressive style throughout the fight. There were many times over the 12-round distance where Andrade seemed to have Fox on his heels, utilizing a powerful body attack, along with quick combinations to the head. Fox had no answer for Andrade's attack as he out landed Fox 158-52. In the end, the decision was never in doubt. Promotor Joe DeGuardia had these comments about Andrade's middleweight debut - "I was very impressed with how Demetrius systematically broke down the much taller and bigger Fox. This was not an easy fight as Fox has an unusual height for a fighter in the middleweight division and an awkward style, but Demetrius never wavered throughout the fight and looked very impressive in winning just about every round. I look forward to matching Demetrius with the elite members of the middleweight division, and will look to do so as soon as possible, as we want to keep Demetrius busy and on the rise." The Andrade - Fox bout was promoted by Joe DeGuardia's Star Boxing, Banner Promotions and A-Team Promotions, in association with DiBella Entertainment. [QUOTE=TheCell8;18155671]Winner of Lemieux-Saunders makes sense. [/QUOTE] I'd pick him to beat both. Kautondokwa would be ok as well. Centeno, too. Rewatching that fight with Fox and Andrade really should take time and acclimate to the division a little more first.